Twelve years ago him+me became us. Inspired by Mel's Ten on Ten posts, I decided to document twelve pictures on the twelfth for our twelfth. Because we are still cute, still dorky, and still in love. 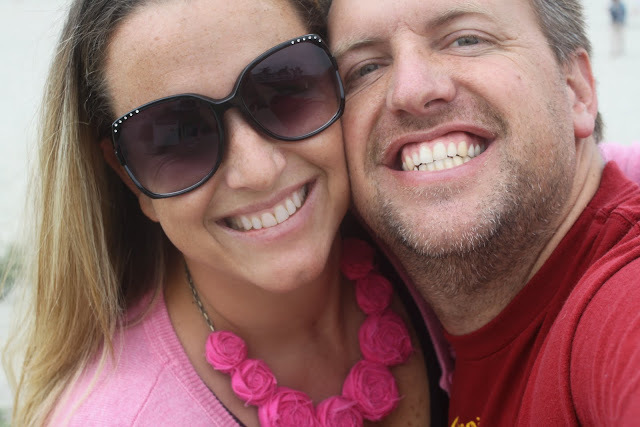 We escaped to San Diego (kidless!) for the weekend. Before leaving I enjoyed a little pre-breakfast, overlooking the bay, with coffee and truffles from our anniversary dinner at Flemings. 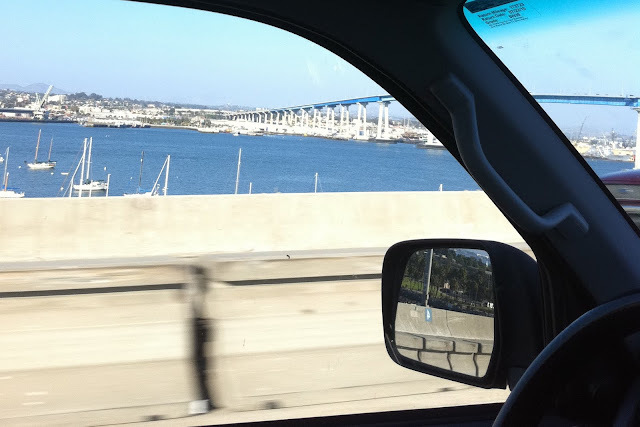 Leaving the lovely isle of Coronado. On a crazy bridge. I somehow scored an oceanfront table at our favorite breakfast place. The kind of place that is so good that you want to tell everyone you know. But then you know that they will then go and tell everyone that they know. Which means that the line that is always out the door and down the street will be even longer. So you are going to be mean and keep it to yourself. Because waiting in line for an hour is worth it. It is that good. But waiting in line for two hours? Not as fun. Cool wives get their husbands cool shirts. Are you cool enough to know why this shirt is so cool? Heading home in the car of our youth. 173,435 miles of memories. Top that. Me? Unsweetened Passion Tea. Obvs. For Jason? Ice water. He's a cheap date. Late lunch at my fave burrito place. I'm a cheap date too. We scooped up the girls from my parents' house (who need their own vacay after this weekend) and brought them to my niece's birthday party. 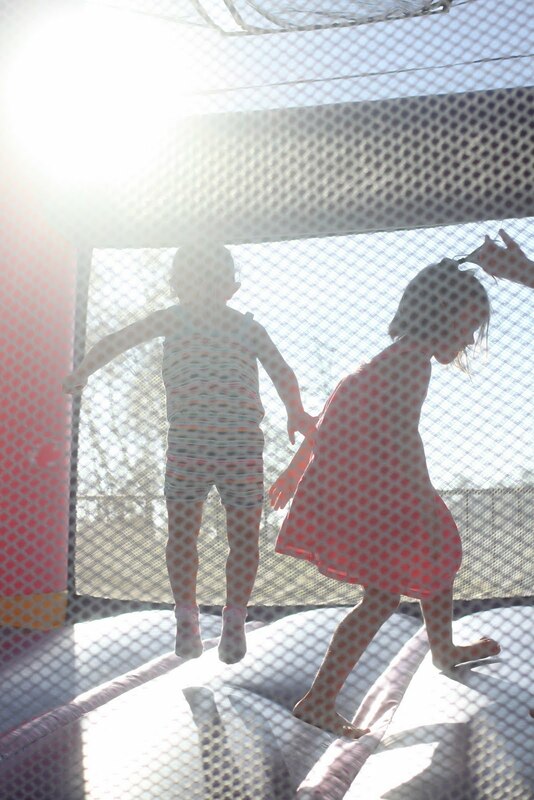 Oh bounce houses, how I love thee. For your magical powers of tiring my kiddos out. Bedtime comes early on bounce house days. Once again, thank you bounce house! Using my mad singular Photoshop skill (text tool) for Happy Sunday. I so want to be the girl in that verse. We have lived a lot of life in the past DOZEN years. A beautiful dozen years. That Lost tee is perfect. Where did you find it? Happy Anniversary! You two look so adorable and so in love...what a great testament to your children and the people around you. I am blessed by you. happy anniversary! here's to another couple dozen!!! Happy! Happy! Happy Anniversary!!! Ya'll are just precious! and on a just as important note- WHERE DID YOU FIND THAT SHIRT?! Happy Anniversary! That LOST shirt is awesomespice! love the 'lost' shirt. where did you get it? Love this post, love the pictures, love your creativity, love that you have been married for 12 years. . . Congrats Mr. and Mrs!!! happy anniversary! can't wait to make it to 12.. and then 50 with my honey! Have you tried a shot of vanilla in your passionfruit tea? It's so yummy! Great, great post! Loved the pictures, loved the words! Happy 12 years to you two! happy Anniversary!!! You guys are so cute together. I LOVE that shirt -- must get one for my hubby! Congratulations! Happy Anniversary! My hubs and I celebrated our 10th on 9/9/10! I want to be the girl in that verse, too...working on it. Little by little! I am hanging my head for not knowing the meaning of the shirt...sigh. Happy Anniversary and many more. I love the documentation of the day. happy happy 12 years! we'll celebrate 11 in January :) And we just missed you in Coronado! We left on Friday after a blissful week of vacation. loved every second. the shirt is total awesomeness...makes me want to explode a hatch somewhere. I love love. And I love the Carsons. The end. And it took me a minute but after reading it a few times, Shepard stood out and then LOST screamed at me. Love it! Happy Anniversary! looks like a great great day to celebrate 12 years together!! Love your necklace do tell where you got it! Happy 12 years to you. I am glad it was such a wonderful weekend. Love that you got to spend some time alone with your guy. Love his shirt. (is there one with the gal's names??) Really love your necklace!! Congrats! Happy 12th! Happy Anniversary Julie and Husband! You are so cute and I am so glad that I get to follow your blog. Thanks for posting all the time. Until we meet again at QBM! Pedro's is the best! It's one of the things I miss the most about the OC. I drove through and got a breakfast burrito almost every day of my pregnancy with my daughter. SO YUM!!! Happy Anniversary! So happy for you! Congrats! So glad you got away! And ate treats and stuff. Happy 12th Anniversary! I love your 12 on 12! Glad you had a great anniversary getaway! You guys are the cutest! Aw! Happy Anniversary! Do share your favorite SD spots! I've only been here 14 months and we're always looking! happy anniversary, mr & mrs carson!! :D sweet lost shirt, jay. by the way, you ARE the woman in that verse, julie. i love you both SO much. you're one of my favorite couples ever. great seeing you tonight! happy anniversary, and T-shirt=LOST of course ;) I was a little late to get in on the saga that was LOST, but once my hubby and I downloaded our first season on the ROKU, the month of December 2009 will forever be known to us as the month we stayed up till 2 am every night watching all 5 seasons so we could be prepared for season 6. Good times. Happy Anniversary! What a lovely post... fun getaway... and oh I love the bouncy houses too... only I am getting a bit big for them now... ha ha! oh... ahem... anyway... I love the verse! love it!!! 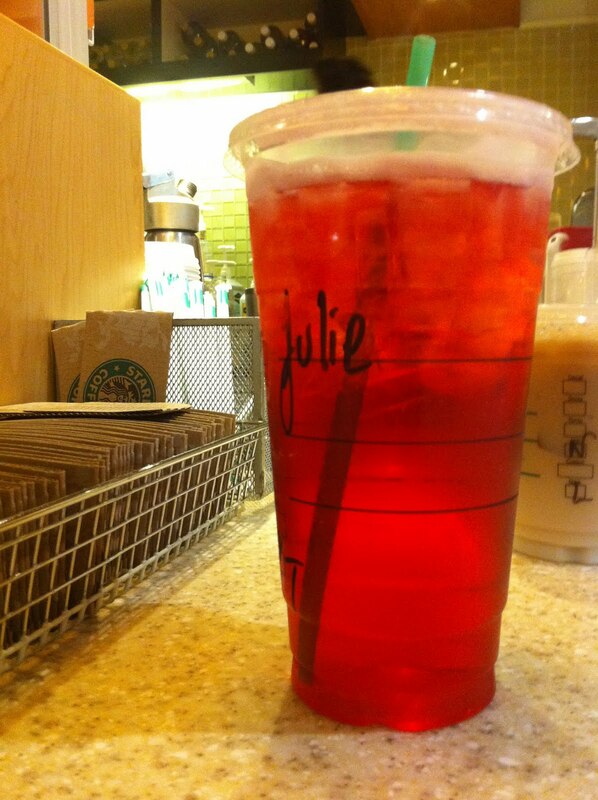 Since we are so tight now, I can ask... You don't order the passion iced tea lemonade, do you? Because just the passion tea is my drink of choice. Seriously.Add the lemon and you've lost me. Happy Anniversary! Our 12th is today. Happy anniversary; looks like a wonderful getaway. Please tell me you ate Moo Time ice-cream on Coronado. Next to gelato in Italy, it's probably the best I've had. I actually remember your wedding and as a then-high schooler, thought it was THE coolest because of the In n Out truck. I wonder how many other MHSG veterans would agree? Pedros Tacos, a family fav to be sure. Wishing you'd divulge the breakfast place secrets...best meal of the day. Happy (a little belated Anniversary !! Life just never slows down does it!? 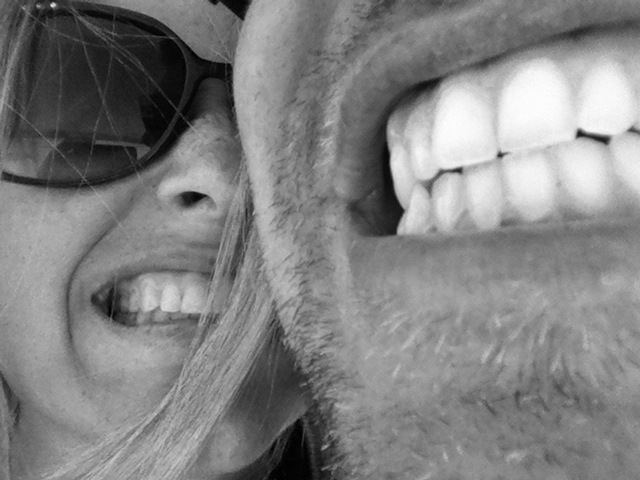 Love the 12 photos on your 12th anniversary...might have to do that next year for our 10th!? Happy Anniversary! Love the 12 pictures for your 12th. We are celebrating 10 years tomorrow! You make an awesome couple. looked like you had a fab weekend! congrats on the 12 years! oh, and just seeing that crazy bridge again made my palms sweaty and my heart race! eeeks! That shirt will be absolutely perfect if you tell me it says "The Candidates" on the back. Love it! You and I are shopping twins I think! We have that same purple Nalgene bottle and we also have the PBK butterfly backpack....if only Cali and Ark were closer to each other....sigh. Oh and Happy Anniversary. I got married on a 12th too..November! You two are SOOO cute! Happy Anny! And you two are the cutest EVAH! Happy Anniversary! May you have many, many more and may your love grow exponentially with each passing year. I can't believe I'm cool! HA!! LOST- loved it!